Post-Holiday Shopping | Barbie Who? I finally managed to dig my car out of the snowdrift it has been encased in this last two weeks, and to celebrate we drove into the city! Yay! We mainly went there so that my husband could go to the library, but I did manage to stop at a few thrift stores and the local craft shop while we were out. It was a very long and productive day. Remember that mismatched doll from last post? The one that was packaged with a Merida doll who had vinyl head and plastic body? Well, her head may have been meant for that weird, hollow body after all. I found seven more dolls just like her at the same thrift store (sorry that I didn’t have the presence of mind to take a picture). Well, not just like her; each one was dressed as a different Disney princess. There were variations on hair, but the head molds and face paint were identical on all of them. To steal a Simpsons joke, we’ll call them Diz-Nee Princesses. They are dolls, they vaguely look like Disney Princesses, and they are much lower quality than the real thing. I was tempted to buy one of them for her dress, but I decided that I really shouldn’t buy a doll just for its clothes. Even if I just donate the doll back afterwards, the dress is likely the same quality as the doll and not worth my money. I will leave them for whomever thought that cruddy Aladdin doll was worth buying. Seriously. He was gone, so somebody mush have bought him in all of his broken, sharpie-covered glory. I can only imagine why they thought he was worth buying. Anyways, as I was looking at the Diz-Nee Princess dolls, an employee at the store brought a new bin of toys out from the sorting area. I was excited to see a few more dolls in it. One was another pack of Diz-Nee dolls, but the other was an awesome bag with three Barbie dolls in it. They cost only $3.00! 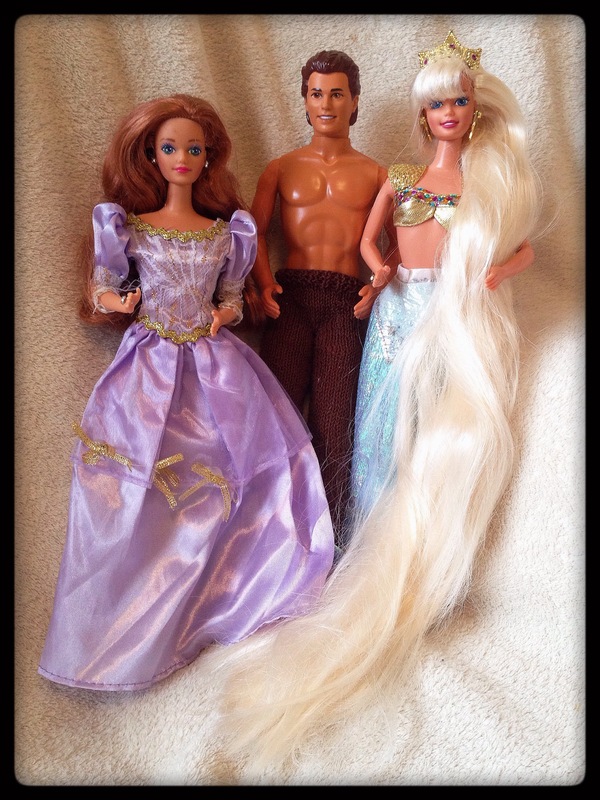 The first doll is Jewel Hair Mermaid Barbie from 1995. She is missing her hair jewels and her fin, but her hair is in remarkable condition. She also has her top, crown, earrings, and ring. She is a really fantastic find! I remember this doll from when I was young. I believe my friend Katie owned this one. I remember that the hair jewels never stuck very well to her hair, but they always managed to get stuck to our clothes. Overall, she is a cool and nostalgic doll to add to the mix. I doubt she will be used for Barbie Who? because I am already quite attached to her as-is. I put her with the Dance Club Kayla doll where they can do their own thing. The other two dolls are Wedding Day Midge and Alan from 1990. Neither has their wedding attire (neither had any clothes; I put them in what I had on hand), which is a shame because those outfits are awesome. Check out those links above; I just love the polkadots on Midge’s dress. Alan needs some touch-up paint on his hair, but otherwise both are in very good condition. Midge even has rings on both fingers! She also has a earrings and a nail in her head (I assume it is where her veil attaches). Because of the wedding connection and her lovely red hair, Midge may have to become Donna Noble. Donna is one of my favorite companions, and this doll strikes me as her Barbie Who? counterpart. I also think that she and Cofelia would make a wicked pair together. I am already scouting out tasteful wedding attire if I decide to go that route for the next doll I create for the blog. I am excited that the knit pants also fit Alan well; his legs are a bit bulkier than Ken’s, but the pants have more than enough stretch to fit comfortably. Alan is much different than the previous Fashionista Cutie Ken doll I found. Ken’s body is much less substantial and isn’t nearly as muscular as the Alan doll. Ken’s body also seems to be hollow. I like the overall look of Alan more than that of Ken. However, Alan doesn’t strike me as anybody from the Whoniverse. This bothers me somewhat, but I am sure that I will watch an episode and the lightbulb will come on. I just need a bit of time to mull it over. Until then, I have plenty of dolls and inspiration to keep me busy. After those amazing finds, I went to my favorite thrift store for happy hour. I didn’t find any cool dolls or toys, but I did find some yarn. 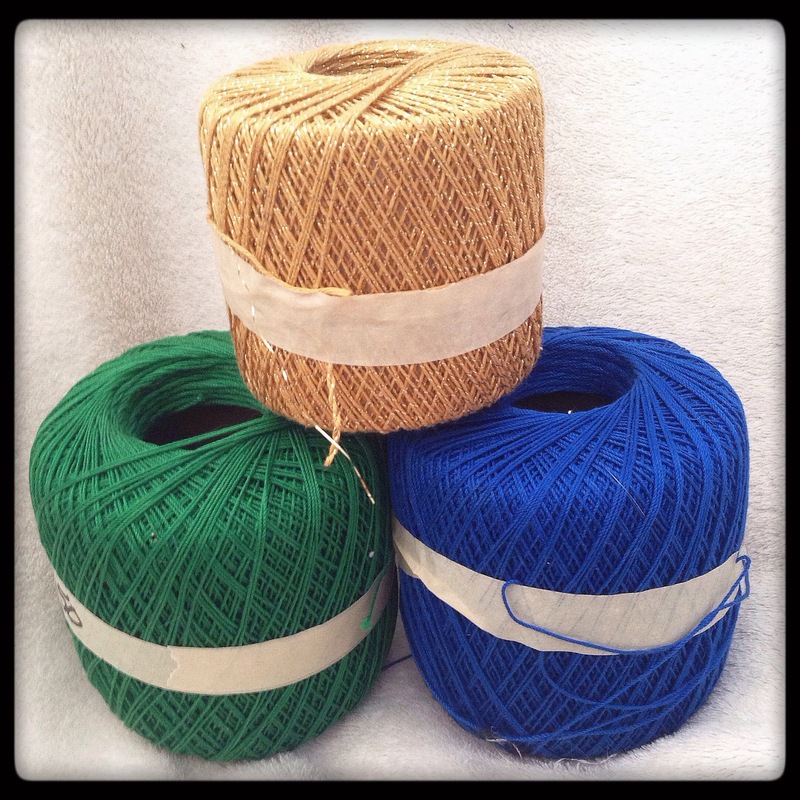 I bought three skeins of size 10 yarn – blue, green, and gold. I bought the blue and green because I absolutely love the bright, vibrant color of them. It may not be sparkly, but it certainly is eye catching. I bought the gold because of the Jewel Hair Mermaid Barbie I found above. I can use it to make a tail that matches her top. I can also use the gold to create a belt and crown for the Merida doll (if I can ever find the time). It is nice to have a plan for the yarn I bought. The three skeins of yarn cost $2.00 total, which is a great because they have so much yarn on them. After that adventure, we made our final stop at the craft store. I spent way too much time browsing all of their cool stuff, but in the end I only bought a single sheet of green plastic canvas. Why? Great question! I want to create an accessory for Peri, and this sheet of plastic canvas is the key to my plans. I want to make some plants to be Peri’s accessory. It will be fun to see how it turns out. I haven’t use plastic canvas for crafting since I was a child. I have fond memories of making Loony Tunes coasters with my mom from a book she bought for us. It was always fun, and it taught me how to read patterns and use a needle. I look forward to working with it. Well, that is everything for today. Peri’s outfit is coming alone quite well! I am almost finished with the body of it. If it fits the doll, I will just need to knit or crochet arms onto it and it will be finished. I wish I had more time to dedicate to it and knock it out, but sometimes life just gets in the way. This isn’t entirely a bad thing; my wrists aren’t complaining about the breaks. I am getting slightly better at working with the tiny needles, but I still need breaks every half hour to prevent wrist pain. I also realized that I spend more time working on these projects than I registered. I have already spent six hours working on this suit, and I’m sure that the sleeves will take an hour each to create. For my next big project, I may have to use the stop-watch function on my phone to get a more accurate number. Regardless, I will carry on and finish Peri’s outfit.